Can someone please update this mod. I can offer 1 million gold or 1650 Crowns. It is simple, lightweight and has the option to hide the quests is perfect. Did you try out this quest tracker already? Afaik it got the same possibilities. Maybe it's not as simple to setup but you only need to do it once and it is still under construction. Bringing back old addons to life might only work for one API version and if the reviver is gone then you are again standing there without a working addon. Or try this quest tracker. I have found its author(s) update this one more often but you never know with add-ons when the next update will show up. 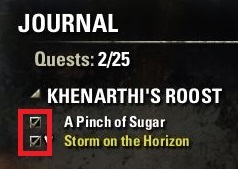 And last, it appears that ESO may be doing something new with their quest trackers. Check out the WrathStone DLC on PTS for more details. I expect the new quest tracking features to be better than what ESO provides currently, but that is only IF and WHEN the upgraded quest tracking gets to the Live platforms. Drakanwulf, the dire wolf that hunts dragons! The quest tracker in Wrathstone is only recognizing the zone's story quests though, and not all of the zone. You are correct, Baertram, and I read somewhere else, that you cannot close the tracker window if you have started a zone's story line with the tracker window open. So, yet another "almost a good job done" for the ZOS crew. Will be integrated into FCOChangeStuff addon then. Thank you all for taking the time to answer or look for some mod and recommend it. The only function that interests me is this one. It is very useful, it allows me for example to remove the main quest from the quest tracker, I can accept the Stuga quest so that it does not bother me, deselect it and will not appear in the quest tracker anymore! Afaik this is also possible within Ravalox Quest tracker via right click on the quests, or the settings menu. i try ravalox but cant find the option.